If you were wondering how exactly to get your hands on Island Expedition rewards, you’re not alone — and honestly, the answer is a complicated jumble of prioritizing kills based on particular mobs. In some ways, this flew in the face of completing the Island Expedition as intended. If you wanted particular rewards, you needed to kill those mobs — and put the brakes on gathering Azerite until you did so. Needless to say this ended up in conflict between players that wanted to take the time and shoot for rewards, and players who just wanted to get their Azerite as quickly as possible and get out of there. In Tides of Vengeance, that will be changing. Blizzard released a blue post today clarifying the changes coming to the system. Honestly, this is how players have always approached rewards — if there’s an easier, more effective way to get said rewards, players will shift their tactics to take that route every time. Of course, when you’re dealing with purely cosmetic rewards — toys, Battle Pets, mounts — not everyone is going to be as gung-ho about grinding for them. Some people just don’t care about the cosmetic stuff, which is where player conflict was coming into play. If you’re queuing just to complete your weekly Azerite grind, you don’t necessarily want to spend extra time on an Island. Island Expeditions are a lot of fun, but the current reward system is an exercise in unneeded complexity. Players are willing to jump through hoops to get loot, but when those hoops are too complex to be easily understood, that’s where frustration comes into play. Make something too random, and players will eventually lose interest altogether — which sort of defeats the purpose of new content. 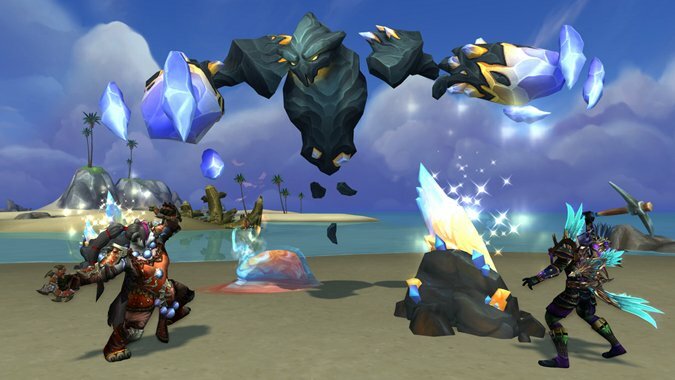 The upcoming changes to Island Expeditions turn that maddening hunt for loot into a much more straightforward process. No more trying to kill particular mobs, just complete the island and cross your fingers. Obviously, completing the Island Expeditions on higher difficulty levels will up your chances at getting loot, but that’s only to be expected. Hopefully the changes will focus player’s frustrations away from conflicting motivations, and square on the random nature of loot drops — which is where it’s always belonged anyway. If you’ve been struggling to get your hands on cosmetic rewards in Island Expeditions, you should be pleased with the changes when they go into effect. Patch 8.1, Tides of Vengeance, hits live servers next week.